﻿ Grandvrio City Danang by Route Inn Group, Da Nang | FROM $48 - SAVE ON AGODA! 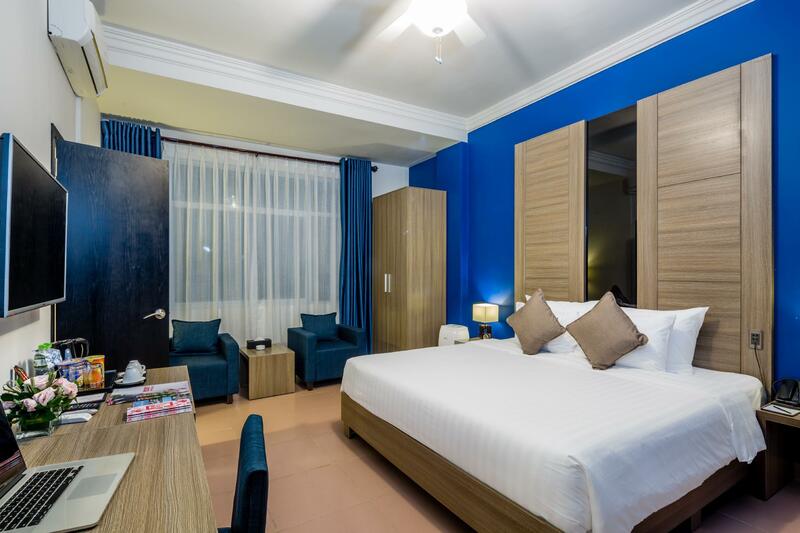 "Good location, overall facilities are up to standard, staff..."
Have a question for Grandvrio City Danang by Route Inn Group? "The hotel is at a good location." "Cab and transportation was easy to access." "(universal), easy access to places (5-20 minutes) locals are super nice and helpful." "Outstanding Management and Staff super good Japanese style H..."
Grandvrio City Danang, located in Hai Chau, Da Nang, is a popular choice for travelers. Situated only 0,1 km from the city center, guests are well located to enjoy the town's attractions and activities. With its convenient location, the hotel offers easy access to the city's must-see destinations. 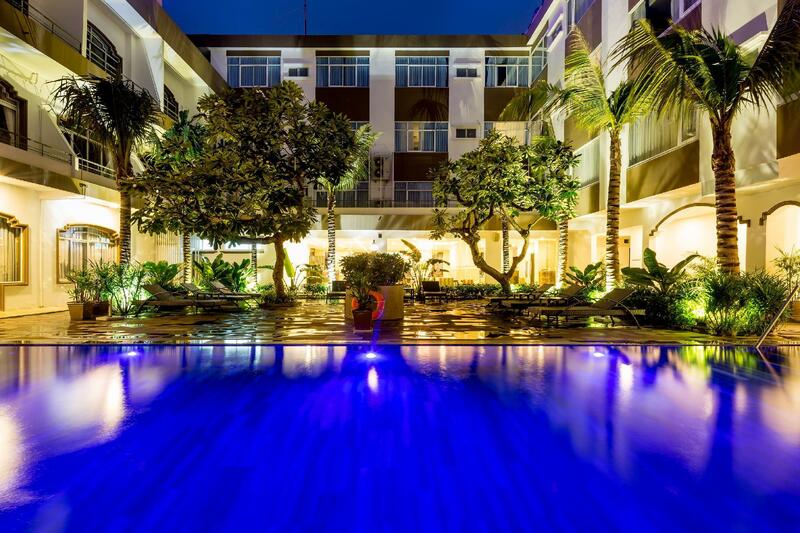 Take advantage of a wealth of unrivaled services and amenities at this Da Nang hotel. A selection of top-class facilities such as 24-hour room service, free Wi-Fi in all rooms, daily housekeeping, laundromat, postal service can be enjoyed at the hotel. Hotel accommodations have been carefully appointed to the highest degree of comfort and convenience. In some of the rooms, guests can find television LCD/plasma screen, clothes rack, complimentary instant coffee, complimentary tea, dressing room. The hotel's recreational facilities, which include hot tub, fitness center, sauna, outdoor pool, spa are designed for escape and relaxation. Whatever your purpose of visit, Grandvrio City Danang is an excellent choice for your stay in Da Nang. "The staff was accommodating enough to let me check-in early..."
Children 6-11 years old will be charged USD 7 when using existing bedding. Children 12 years and over are considered as adults and will be charged USD 27 per child per night with extra bedding provided. Guests are required to inform the property in advance. Extra bed is not available for Standard and Junior Studio room types. We went to Da Nang with the whole family (10 people) last week. We totally enjoyed our stay. Grandvrio City Danang has made a plus for our stay. The hotel is at a good location. It was very nice of them that they upgraded our rooms. The upgraded rooms were spacious with a living room and it was great for our family to have tea and relax. The staff members are all very helpful and friendly. Our needs were all accommodated and we could feel their attentive service. We have some old people in our group. They understand our needs and make good suggestions. All our family members had a great time at this hotel. Every night we came back to the hotel, we felt like home. We highly recommend this hotel. We would choose Grandvrio City Danang again next time when we come back to Da Nang. Hope we can come back very soon! We booked a premier superior room with expectation that the room should have carpet floor and “large bed” should be literally a large bed, ie. King bed. In reality, the room has no carpet and “large bed” made from 2 single beds combined. Fortunately the staff was quite friendly to hunt for a carpet room for me upon request , but nothing can’t be helped with the bed. My poor husband keep falling in between the 2 beds. Quite disappointed with the bed. Other than that everything else was good. The place is within the walking beach direction. Cab and transportation was easy to access. The room was a decent size as well as bathroom no tub. The ac unit is a wall and ceiling fan. Rug room. But what I notice right away was the sewage smell coming from the shower. The staff address it with oil scent candles. The elevator are extra small max 4-5 people. FYI, the safe in the closet the housekeeper has a master key that can open it (so definitely leave your value at your risk). The pros are that plenty of friendly outlet (universal), easy access to places (5-20 minutes) locals are super nice and helpful. WiFi accessible. The breakfast buffet is decent, some items changes daily and about 10 minutes ride to the dragon bridge. Warm and Hospitable staff. Attentive service from all hotel staff. (front desk , chambermaid , waitress, maintenance staff, towel reception at gym and Onsen). Accomdating. Many koreans, especially family or friends. They spoke loudly at late night, also because of strange building structure it is noisy hotel. Most visitors are Korean, Chinese, Japanese. No western people. I don't want to recommand this hotel to anyone. Except staffs are very kind and has a gym, sauna, no more to stay. It is a hotel that seems to cater for the Japanese tourists so the breakfast seemed to reflect that with what was offered, so not to my taste as a westerner. However, the bed and pillows as well as the shower were second to none and made up for this. I would certainly come back but I suspect, the price will go up as the seasons change. We came here for our wedding anniversary celebration and the hotel has upgraded our room to give us a room with great view. The hotel staff is very helpful especially Miss Dung and a young sweet lady staff who was on duty at the reception on 20th Aug night(sorry can't recall her name). The latter had given us info on the food and coffee which we should try and some brief explaination of Vietnamese language. Wide selection of food for breakfast and the onsen was well maintained. It was location, so kind staff, small pool, delicious food, juice almost perpect without hotel massage & breakfast. good location, overall facilities are up to standard, staff are helpful and nice. highly recommend to stay at this hotel. Dear Bruno, Thank you for your wonderful review. We are so glad you enjoyed so many aspects of your stay including the room, the breakfast and our service. It's definitely a boost for us every time we hear positive reviews such as this. Please come back again soon for another amazing time! The good hotel shall be recommended to stay/enjoy when travelling to Danang. Staff courteous, helpful n attentive..
Nice hotel. Clean room. Good selection of breakfast. Staffs are friendly. They even have Onsen for the guests to use.